Kancharla Gopanna, popularly known as Bhakta Ramadasu or Bhadrachala Ramadasu, was an ardent devotee of Lord Rama. 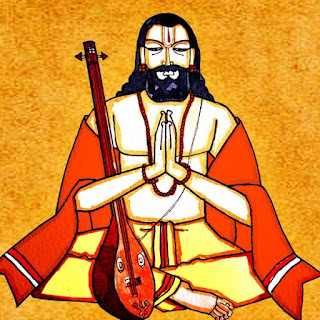 He lived in the 17th Century CE (Current Era) and composed around 200 Keertanas (songs) on Rama in Telugu language. He constructed Sita Ramaswamy temple at Bhadrachalam during his tenure as Tahsildar of the place. In his composition 'Idigo Bhadradri' he describes the magnificence of Bhadrachalam temple. Here is Bhadradri i.e Bhadrachalam. There is River Gautami (Godavri), have a look. This the abode of Raghupati (Rama) who is residing with wife Sita and brother Lakshmana. The temple looks beautiful with gold entrance gates and walls. The beauty of the glittering Chakra (the celestial disc) is unparalleled. Prostrate the abode of Lord Vishnu (i.e Vaikuntham) on Earth of this Kaliyuga (an era in Hinduism). The beautiful flower garden with flower of Punnaga flowers and Pogada flowers looks like a creamy flower house. This is the abode of Ramadasu's Lord - the protector of all. The last line of all Ramadasu Keertanas invariably contains his name. Listen to the Keertana sung by Balakrishna Prasad.